20 Natural Insomnia Remedies and Ways to Get a Better Night's Rest and Fall Asleep Easier #infographic ~ Visualistan '+g+"
If you struggle with falling asleep and staying asleep, you are not alone. Roughly 60 million Americans suffer from insomnia annually. The causes of insomnia are broad, and often deeply rooted in the individual’s habits, health, and emotional wellbeing. Stress, grief, and trauma often contribute to insomnia. Chronic pain, asthma, allergies, and other physical ailments may also disrupt sleep and lead to insomnia. Medication may also contribute to the issue. 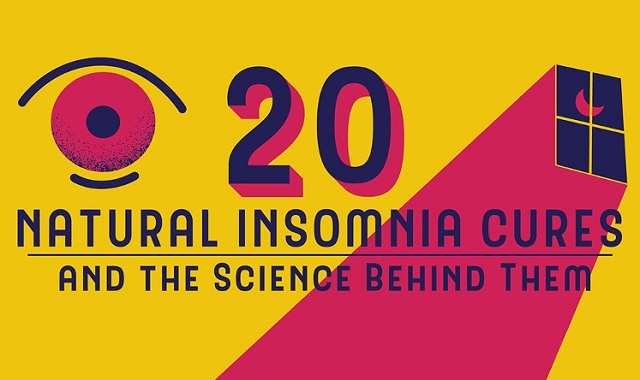 This infographic from Mattress Clarity (MattressClarity.com) provides 20 possible natural remedies to help relieve insomnia and promote healthy sleep. Many of the remedies provided are backed by research and science like physical activity, melatonin, and lavender oil, while others are drawn from traditional medicine like dried jujube, poetry, and worry dolls. Since insomnia is often a multi-faceted problem, it is important to take a multi-faceted approach and add various methods to your healthy sleep toolset. One important thing to note is that cell phones and other electronic media produce blue light, which the brain interprets as daylight. This suppresses melatonin and disrupts your natural rhythms. Therefore, it is wise to avoid screen time within an hour before bed for quality sleep.